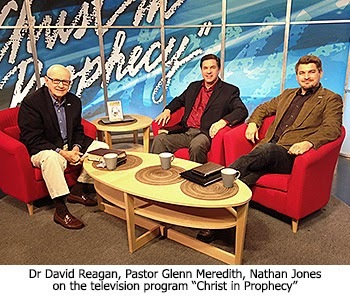 To answer that question, Dr. David Reagan and I on our television program Christ in Prophecy invited Glenn Meredith, senior pastor for 30 years of Brookhaven Church in McKinney, Texas. Pastor Meredith is a very gifted communicator who is able to present the depths of God's Word in simple to understand language. Last fall he presented a sermon about heavenly rewards that deeply impressed Dr. Reagan, and so he was invited to share some of what he's learned about this topic. Dr. Reagan: Glenn, the most fascinating part of your sermon on heavenly rewards was the last section where you talked about whether or not these rewards would be something temporary or permanent. The traditional teaching has always been that the rewards are very temporary. You receive them, then you put them back down at the feet of Jesus to honor Him. That's it. You walk away and that's the end of your rewards. This imagery is based primarily upon one scene in the book of Revelation, where in chapter four it shows some elders in Heaven who have some golden crowns and they place them at the feet of Jesus. Glenn Meredith: That's always sort of been my understanding. It was certainly what I was taught, or at least what I kind of picked up through the years. That was we would get these crowns if we'd live faithfully and we'd be given a crown perhaps at the Judgment Seat, but then very shortly thereafter there would be this great worship service there in Heaven where we'd take off our crown and we'd casted it at the feet of Jesus. Then, from that point on, everything is just the same for each of us. We got nothing else going forward. As I was reading the Bible, one day I'm looking at 1 Corinthians 9 where Paul is exhorting the Corinthian believers to run this race to win this crown. Paul says to them, "That the runners who runs in the games run to get a crown that is temporary, but we do it to get a crown that will last forever." And so, while it seems a little strange that his whole point there is not to run for a temporary crown, if our heavenly crown was temporary, then that takes away some of the motivation I think of why we should strive for it. But, Paul says the opposite. H says, "You ought to run for this crown that will last forever." Get over to 1 Peter 5 where he talks about the Crown of Glory that is given to faithful pastors and shepherds of the flock. It says, "When the Chief Shepherd shall appear, He will bring with Him a gift to you — an unfading Crown of Glory." That word "unfading" really means "perpetual" or "forever," and it's the same word that is used earlier in 1 Peter where he's talking about our inheritance in Heaven which is unfading and imperishable. And so, I believe that the rewards are going to be permanent. I believe as you've already pointed out, Dave, that this authority that we're given to rule and reign is in the Millennial Kingdom, but He also says that we will reign with Him forever and ever in the eternal sate. That's why I believe this authority is permanent. Dr. Reagan: What's wonderful to me is to think about the fact that we will have as he puts it, "the mind of Christ." I'm not sure what all that means as that's a mighty big statement, but it says we're going to have the mind of Christ. We'll be in glorified bodies and will be in such a state that we will not be the least bit jealous or envious of any other person's crown or any glory that is given to them. Instead, we would want to go up and hug them and say, "I'm so glad for you. It's so wonderful that you did all these wonderful things for the advancement of the kingdom." Isn't that wonderful to think of having an existence like that? Glenn Meredith: Exactly! Think about how you feel when your children or when someone that you love excels or does something that is honored. You are happy for them. Well, I think that's how it's going to be in eternity. We are going to love one another there. We are all part of the same family. We are going to love one another, so I think that's exactly right. I believe rather than being jealous I think we are going to look and say, "Man, I'm just so blessed by you." Dr. Reagan: I think in our fallen state right now that's very hard to imagine. We think we're just going to be consumed with jealously and envy. Glenn Meredith: Yes, that's correct. Nathan Jones: There's a beautiful scene in the movie The Chronicles of Narnia. It shows I think C.S. Lewis believed what you do, Pastor Glenn, that these crowns we're given we keep. You use them as acts of worship. You'll take them off and bow before the Lord, but then you put them back on. There's one scene where the four children each get a crown and each get an area of the kingdom to rule over. They're beautiful crowns. The prop designers did such a good job making the crowns for the movie. You watch the kids put them on again throughout what is the remainder of the movie. Because of the Bible's teaching on crowns, I believe we will continue to keep our crowns, because we are all living examples of God's workmanship through us for all of eternity. We know we don't get our rewards only to just give them back to Him, No, forever we are praising God based on the works that He did through us here on this earth. That's a heavy burden to bear, but it's also a wonderful burden. Glenn Meredith: Too many Christians I believe are just sort of passing through this world and not really intentionally trying to make a difference in the world. They are not using those spiritual gifts that God has given them. They are not taking advantage of the opportunities that God lays before them. So, it's really important we get such a brief time. This life that we live is like a vapor that appears for a little while and vanishes away, and yet it has eternal ramifications. Not just where we're going to spend eternity, but really what our eternity is going to be like and the rewards that we will have matter. I believe the service that will be performed for Christ in the Millennial Kingdom and Heaven is all dependent upon how we live right now. Dr. Reagan: I'm glad to hear you say that, because I was going to ask you to wrap up this particular section by saying, "What's the message?" Well, you just gave the message. The message basically is that once you begin to believe in what the Bible really says about rewards and what it really says about good works, you begin to be motivated even more than ever before to really get serious about being more than just a back pew Christian who sits there and absorbs and never does anything for the advancement of God. Glenn Meredith: That's exactly right. Dr. Reagan: Well, that's a tremendous message and I appreciate you sharing it with us, Glenn. I remember the day that you delivered it. I just got so excited. I recommend people get a copy of this particular resource which is entitled Heaven: Its Nature and Meaning. It contains three programs that we did about Heaven that people have always been enthralled by, particularly one of the subject in there, "Will your pet be in Heaven?" We go into great detail about what all the Bible has to say about that, but people just love to watch that program. In fact, we have pets on the program. We even have a cat. I don't care for cats too much, but we had a cat so the cat lovers would be happy as well as the dog lovers.